Power System Ultra speed rope (3 meter) is an effective tool for cardio workouts. High quality, durable plastic-coated steel cable with fully adjustable length. Lightweight ergonomic handles. Perfect for athletes of all levels, including crossfit. 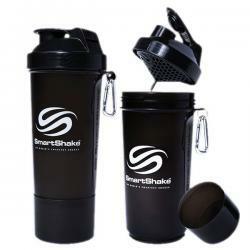 SmartShake is a high-quality, leak-proof shaker cup that stores your daily dose of pills and powders. With it´s two storage compartments and slim grip SmartShake offers a versatile shaker that is easy to bring and carry around. SmartShake’s unique design is compact, yet light. And thanks to its snap-on strainer, there are no loose parts.